At Electromagnetic Field 2014, the conference badge was no ordinary piece of laminated paper attached to a lanyard, it was instead a TiLDA MKe. From the description on the EMFCamp website: Announcing TiLDA MKe: "At its heart the badge is an Arduino Due compatible 32bit ARM Cortex M3. A rechargeable battery will keep it running for days, and you can charge it over USB when the juice runs out. We added a 128x64 pixel LCD screen, two RGB LEDs, a radio transceiver, joystick, accelerometer, gyroscope, speaker, infrared, and all sorts of other fun parts." 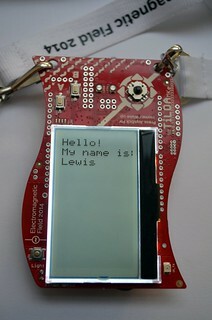 I am attending BarCamp London X at the weekend, and they said to bring your own conference badge, and as the TiLDA MKe is definitely the most advanced conference badge I have, I decided I would take that. I've uploaded the latest code to the badge, and now made it display a name, using instructions on the wiki page (TiLDA MKe) and help from people on IRC. Maybe I'll try something more advanced later!